For 2015, the Ford Expedition continues with its traditional body-on-frame construction. Several updates, including a turbocharged V-6 engine, give this vehicle a lease on life. A more comprehensive revision is needed, one that may still be two or three years away. Sales, however, have not suffered for this big SUV. 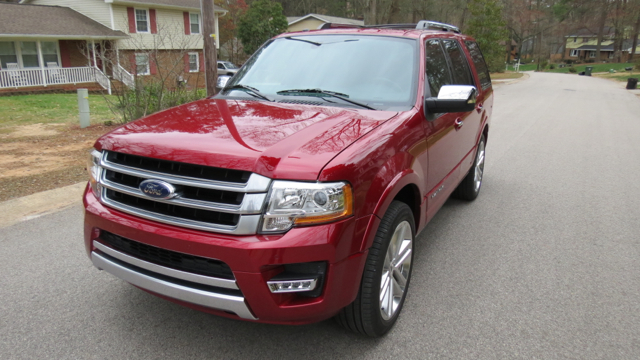 The refreshed 2015 Ford Expedition. Full-size, traditional body-on-frame sport utility vehicles were supposed to have been on the way out and for a few salient reasons: they typically are less fuel efficient than unibody crossover utility vehicles, and offer smaller cabin space than CUVs. Furthermore, they also consume more gasoline than commensurable models. However, body-on-frame SUVs provide superior towing capabilities. Therefore, such vehicles have received a reprieve in the past year, especially as gas prices have fallen to almost half the rate drivers were paying just a few years ago. As one result, Ford Expedition sales rose by 16.4 percent to 44,632 units in 2014 and are up 10 percent through March 2015. Moreover, sales should approach 50,000 units for a model that once looked as if it were on the way out just a few years ago. 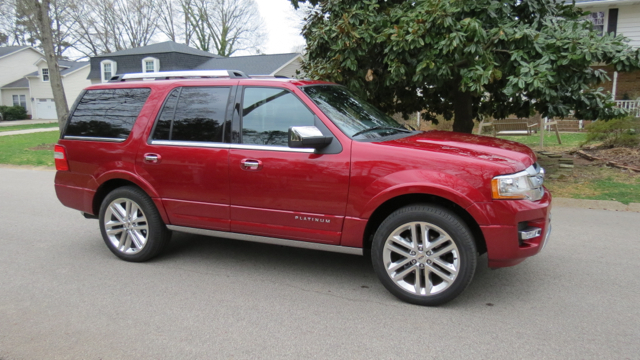 The Ford Expedition, along with its upscale Lincoln Navigator sibling, were refreshed for the 2015 model year. Both full-size SUVs are based on the same platform released in 2007, what makes for a long model run for these vehicles. Ford could have brought forth a fourth generation Expedition, but the automaker has poured its resources into producing an all-new, aluminum-bodied Ford F-150. That verdict effectively allows Ford to buy itself some time, perhaps another three years before extending the current F-150’s platform to the Expedition. Given that Ford rolled out an update, the changes for the Ford Expedition are not comprehensive, but are still noteworthy. The most significant changes begin with the exterior, with an updated and more pronounced front fascia. However, from pillar to pillar the look is unchanged and the Expedition’s visage has aged. Indeed, place the Ford Expedition next to its chief rival, the Chevrolet Suburban, and the Chevy is easily the more modern looking of the two. Inside, the cabin is refreshed and provides space for eight. An extended wheelbase version, the EL, adds no room to the cabin space, but extends the storage compartment by a foot. Yet, the cabin is already roomy with seating for two up front and seating for three each in the second and third rows. Ford also allows you to swop the middle row seat for a pair of captain’s chairs. The 2015 Ford Expedition is priced from $44,585 and is sold in XLT, Limited ($54,180), King Ranch ($58,410) and Platinum ($59,370) editions. Add about $3,000 to the price to obtain a 4×4 model and another $2,650 for the extended wheelbase edition. Available packages and upgrades include a dual-headrest DVD system by Invision ($1,995), the second-row Captain’s chairs ($795), a rear load-leveling suspension ($280) and 22-inch polished aluminum wheels ($2,610). Consequently, your final price could approach $70,000 or just a few thousand dollars below the comparable Lincoln Navigator. Interior updates include the latest SYNC infotainment system with a MyFord Touch update, what brings in an 8-inch color display for that system. The system also includes a pair of full-color 4.2-inch screens in the instrument gauge. Available technologies include passive entry with push button start, a Sony audio system, a rear view camera, front and rear parking sensors, ambient LED lighting and Ford apps, the latter useful for trailer towing and off-road driving. A new leather option package — Brunello leather-appointed seating in red wine with exclusive accents and French-stitching or Ebony seats with gray accents — is also available. Ford claims that the interior is quieter than ever as the Expedition benefits from sound-deadening materials added to two areas: the headliner and to the door trim panels. Furthermore, new carpeting also absorbs noise. Acoustic glass for the driver and front passenger windows also mitigates sound in all versions above the standard XLT edition. Another important change is found under the hood. The big Ford has long represented V-8 power, but for 2015 the aged 5.4-liter V-8 engine making 310 horsepower has been replaced by a turbocharged V-6 engine. That engine, displacing at 3.5 liters, makes 365 horsepower. Two turbochargers, direct fuel injection and variable valve technology combine to optimize horsepower, what Ford calls “EcoBoost” technology. Ford pairs this engine with a six-speed automatic transmission. The improved power from a smaller footprint results in a boost to fuel economy too. Indeed, where the previous model was rated 14 mpg in the city and 20 mpg on the highway, the 2015 Ford Expedition is rated 16 mpg in the city and 22 mpg in the highway. A more modern transmission would have extended that range too, but that’s perhaps a year or two away. Thus, achieving 25 mpg on the highway may someday be attainable, an unthinkable goal for a gasoline engine powering a ponderous SUV. Ford’s EcoBoost technology has been around for six years. And in every application it has brought more power and better fuel economy to the respective vehicle line. Indeed, with the Expedition, you have strong off-the-mark acceleration with the added boost kicking in at 2,250 RPM. In fact, the 420 foot-pounds of torque offers approximately 20 percent more highway power than the previous model. The result is a more powerful powertrain combination, one that is more modern and better suited than the previous arrangement. Will you miss the V-8? No, not at all. Another area where the 2015 Expedition has received a much-needed change to the suspension system comes by providing a continuously controlled damping system with three drive modes — comfort, normal and sport. Specifically, this exceptional system automatically adjusts damping by analyzing the vehicle’s weight, the steering feedback and road fluctuations to disburse body and wheel roll to provide a superior ride. The electric power-assisted steering system is also new, what provides improved maneuverability when driving at low speeds to bolstered up feel at higher speeds. Equally, this translates into ease of steering effort and a more engaging drive. And as for towing, this SUV offers 6,000 pounds of standard towing capacity, extendable to 9,200 pounds when the optional heavy-duty trailer towing package is selected. On the other hand, Ford’s largest crossover, the Explorer, pulls up to 5,000 pounds. Thus, for the best combination of heavy-duty towing and maximum passenger space and payload, the Ford Expedition wins hands down. 2015 Ford Expedition photos copyright Auto Trends Magazine.